Is this an extreme case of "second sock syndrome" or what? I have five completed socks. Now I need to complete their mates so I have five pairs of socks. This is all I've been working on recently so I don't anticipate any real problem finishing these up. I like the variety of the different yarns and colors. I don't get bored because I can just pick up another sock. Don't you just love this yarn? I started working on this one this past week because I wanted to see how it would pattern. I didn't know if it would be stripes or what. 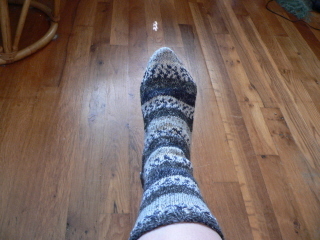 I'm a little late on this self-patterning sock thing. Although I bought this yarn years ago, I wasn't very skilled with sock making yet and I didn't want to make any mistakes with this nice yarn so I waited until I had a little more experience. I finished this sock yesterday. It was fun going along and seeing what would show up next. I'm wondering about the second sock, though. It won't match exactly. I guess that really doesn't matter. I don't want to get all OCD about it. It's actually cold today. It's 9am and the temperatures are in the 40's. Wow. The forecast is for temperatures going into the mid-60's. It looks like it will be seasonable for the rest of the week, though. The sun is shining, which is nice, and will make it feel warmer. We're mid-way through the beginning ASL class and it looks like we have almost enough enrollment for the intermediate class. That will keep me working through the beginning of December. I have to tear myself away from the knitting needles long enough to make a Halloween costume for Lorelai, along with some denim pants. I have the fabric. I just have to get started on that. I also plan to make a poncho for Kelly on the knitting machine. The trick with that is to actually get the machine out! Hopefully, this week I'll get on those projects. I was mentioned in the Harlot's blog!! It was a blast. From there I hopped in a car and went up to Knitty City, a charming shop uptown. (Was it uptown?)" Since my journal (this here page) was linked, that would make one assume that Stephanie has actually read this journal and seen pictures of my humble projects. Taking into consideration her latest project, that sort of scares me. Still, I could not contain my excitement last night when I read this entry. This is someone who should make you starstruck, if she weren't so downright down-to-earth. So, it's pretty darn cool. The weather is fall-like and sunny. Since it's Friday, I'm off to the theatre to visit with Kelly and Lorelai and decide what we should do for dinner. We're trying to watch the remaining second season episodes of LOST before the new season begins. With Lorelai's bedtime getting earlier, we can usually only watch one episode after dinner before they must head home. We may have to add some more LOST viewings during the week. It's Talk Like a Pirate Day, folks. Yes, you heard that right. I'm not exactly sure what the origin of this day is but I'm guessing it's not a Hallmark holiday. I haven't seen any pirate-related greeting cards lately. 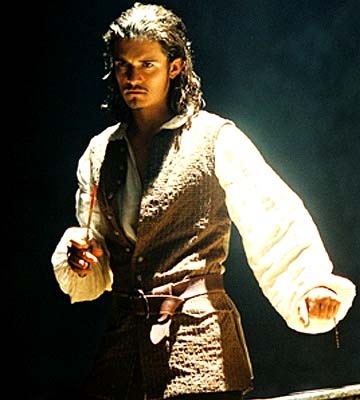 If we talking pirates, here's the one I'm interested in. I had a very busy weekend. On Saturday afternoon, Kelly and I went to see her friend, Chris Crosby, in Thoroughly Modern Millie at Hofstra. It was wonderful! They use the sets and costumes from the tour so the look of it was really nice. Chris played Trevor Graydon, the part Marc Kudisch played on Broadway, and he was perfect for the role. He was funny and sang the songs beautifully. Missy Dawes (I hope I have her name spelled correctly), who was Sandy in Smithtown's Grease, played Millie and I swear, she could have stepped in for Sutton Foster on Broadway. That's how good she was in this show. Millie will definitely be her "signature role". It was lots of fun. We obviously knew how to get to Hofstra but had such a hard time finding the theatre! It resulted in the usual silliness that ensues when Kelly and I go somewhere together! Yesterday, I went to Knit Out, as planned. It was in Union Square in Manhattan. It was a beautiful day, though it was hot in the sunshine and I should have thought of bringing sunscreen. My shoulders are a little sunburned. I'd never attended Knit Out before. It was really fun. They have instructors doing demonstrations so I was able to learn a few things, particularly invisible cast on. Actually, in doing online research, I found several pages about invisible cast on but it appears that you wind up with live stitches you can pick up later. This technique I was learning yesterday appears to be crochet cast on. You crochet a chain first and pick up stitches in the chain and knit and purl them (ribbing). When you're done, you can pull out the crochet and have a finished edge that looks like the stitches just start there. It's also very stretchy, which is nice. I had to do it a few times to get it right. There are no vendors, no one is selling anything. 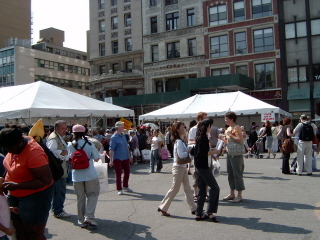 However, yarn shops and publishers advertise in booths and give out free magazines and patterns. One booth was giving out free knitting needles and the line was amazingly long. I thought that was a waste of time. They were huge needles, which I don't really use, so I didn't bother. I really wanted to go to see Stephanie Pearl-McPhee (aka the Yarn Harlot). Stephanie at the author's table with the gansey she is knitting for her husband. It was fun meeting her, although she didn't give a "talk" like she has done in other states. This was just a book signing. She wrote in my book, "Obsession is normal" and said she'd been touring so long, she couldn't remember how to write her name. She pointed to her name in the book and said, "And it's right there, I just have to copy it." 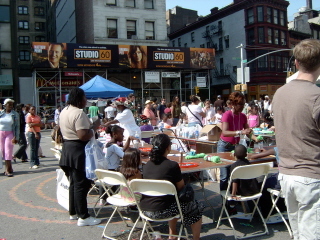 There were tents for people who wanted to learn to knit and crochet. There was also an area for kids crafts, which looked fun! 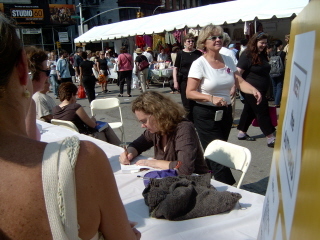 As I was standing by the author's table, waiting for the Harlot's appearance, I was knitting a sock. A woman came up to me and asked if I was knitting socks and said she'd love to learn. 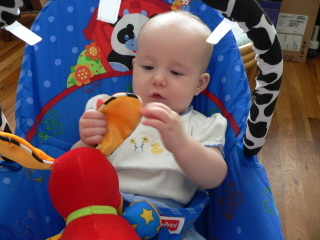 So, I showed her how the sock was constructed and gave her some information about where to find help on the internet. It's amazing how you can meet people you've never met and just talk about this craft like you've known each other forever. When you have a common interest, it's easy. 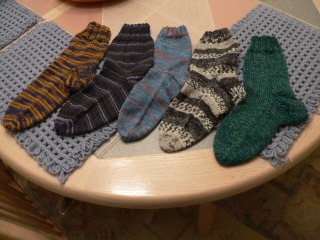 I'm currently working on five pairs of socks in various yarn weights and needle sizes. 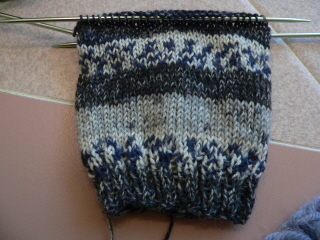 Two socks are complete at the moment. The sock on the left is the self-striping yarn and the needle size is 1. The pattern is the basic sock "recipe" from the Yarn Harlot's Knitting Rules book. 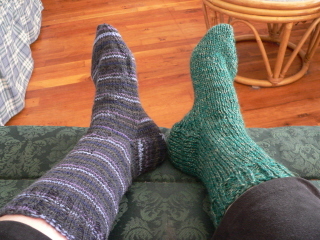 The sock on the right is made from Brown Sheep's wildfoote yarn, knitted two strands together on size 5 needles. I found this pattern on the internet and I actually got the yarn from ebay. I don't remember why I decided to buy it. I just did the "buy it now" thing, I didn't bid. No one had bid on it, apparently. It was cheaper than I could buy it on the internet so I guess I figured it was a good bargain. It's not apparent in the picture but it's a bit variegated, not solid green. The color is called "jungle". Really nice. I'm also working on another pair of the worsted weight socks, using yarn from the same company that made the lovely purple yarn I used for the socks I made recently (size 6 needles). It's this lovely color 101 in supermerino. Heck, I can wear those socks with practically any color imaginable! I have a pair started using 100% merino wool sock yarn from this site. It's beautiful, turquoise blues and purples. Those are tiny stitches, size 1 needles. The last pair started uses this yarn, although I don't see the color on this page. The yarn I have, I bought several years ago at a yarn shop and it's dark blue and natural color. I'm not sure if it will stripe or what. I'll have to wait and be surprised by the results. These are knit with size 2 needles. I figure if I have all these socks started, I can just switch which one I'm working on whenever I become bored. The weather is pretty darn nice after two days of soaking rain, thunder and lightning. Enjoy! 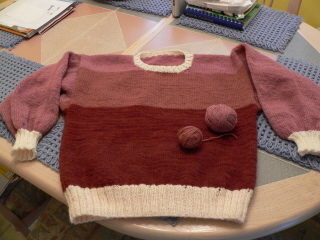 Here's the sweater and what's left of the yarn. I thought I'd have less than that. Still, I never would have been able to do the ribbings in that yarn. There really wouldn't be enough. 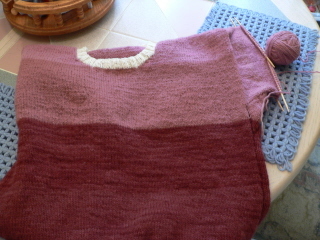 So, now I know I can get a whole sweater out of a package of homespun with the sleeves I like. I can buy the seven-skein packages online. They have natural color wool as well, which looks lovely. Good morning! As usual, I have some pictures to post today. 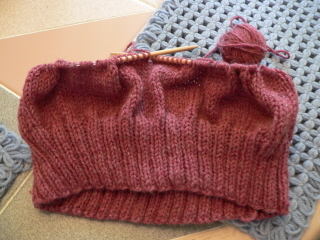 First, I've finished the second, more comfortable sleeve on my ongoing sweater project. You can see from this picture how much bigger it is than the first sleeve I did. This was taken while I was still working on the second sleeve. The sleeves are aligned at the top. Here is the comparison of the two completed sleeves. The first sleeve is on the left, the second is on the right. Now, I've ripped back the first sleeve (or, in knitting terms, "frogged" it - as in, "rip it, rip it") and started it over using the instructions I used for the wider sleeve. 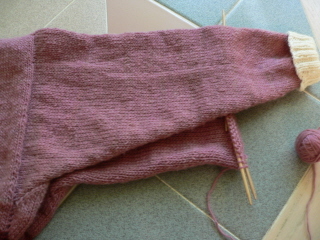 I've reached the point where I finished decreasing the gusset and I'm just working on the sleeve stitches now. I hope I can finish it this week. I'm planning to go the Knit Out event on Sunday afternoon. Since South Pacific closed this past weekend, I can get a day off from babysitting. At this point, it looks like the weather will be perfect. 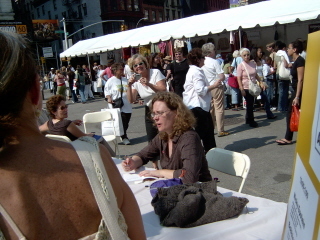 I'm excited because I'll have a chance to see the Yarn Harlot, herself, Stephanie Pearl-McPhee, in person. I've read her books and from reading other knitter's blogs, she's even funnier in person. I can't wait! 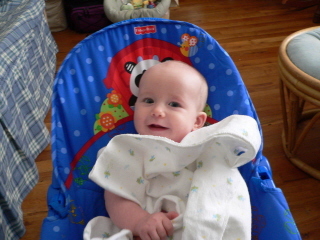 Speaking of babysitting, this past Sunday, I got some lovely pictures of Lorelai. She's quite the enthusiastic little model sometimes. She's just so cute. It's difficult to take pictures of her when she's playing with something or when she gets excited because she's constantly moving. 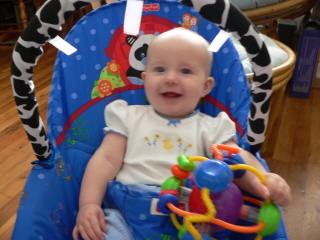 Digital cameras have trouble keeping up with constantly moving children! I started teaching Beginning ASL again last night. This must be a record, three semesters in a row. Actually, I have four students in this class and I've been told I must have five for the class to run. I guess they relaxed that restriction this time. This course ends October 25 and the intermediate class begins October 30. I've never had enough students for this course so I've never taught it. I don't even have the materials for it. However, there seems to be, from my count, enough students from the last three semesters expressing an interest in the intermediate class that it might just run. My fear now is that no one at Dix Hills will be able to find the materials for the intermediate class. We shall see. Five years. Fly your flags and never forget. God bless the U.S.A. I'm not there. Let me breathe a sigh of relief and go on with my regularly scheduled day. 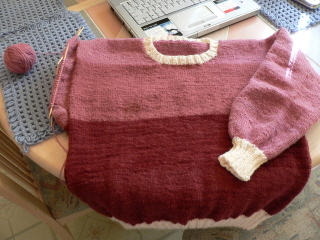 The second sleeve on the sweater is progressing nicely. It's a little hard to see the progress because it's curling a bit but it is progressing. In the meantime, so as not to become bored, I've been working on other things. 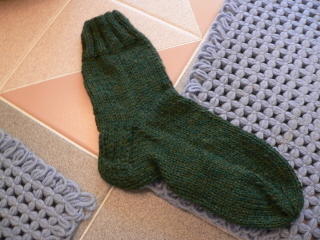 Here's the first completed green sock. I might start the second one later today. After these socks, I really should finish the other pairs of socks I have started. 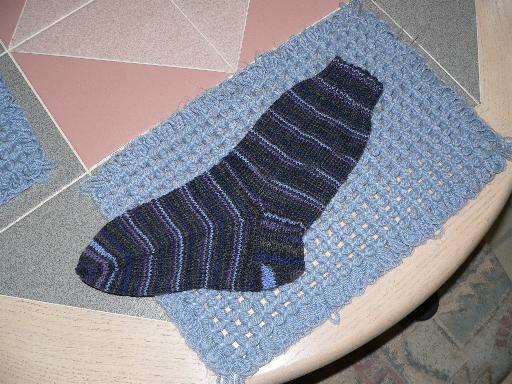 I have one completed blue striped sock. These aren't as quick to make as the worsted weight socks. This is sock yarn. They'll be nice for the fall, though, so I really should finish the second one after I make the second green sock. This is self-striping yarn, which is so much fun. You can see that the only place it doesn't do the stripe effect is the heel, which is knit back and forth and not in the round. The striping effect is so very cool, however. 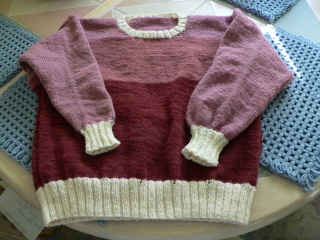 Here's a picture of a sweater I made about ten years ago. This pattern is "muted musician gansey" from the very wonderful Knitting Ganseys book by Beth Brown Reinsel. This was my first attempt at gansey knitting. I love this sweater. It fits me better than any sweater I've ever owned and I wear it constantly. Unfortunately, it doesn't look much like this picture anymore. When I made this sweater, I wasn't sure about buying higher quality yarn because I wasn't sure I'd do a good job knitting it. So, I bought the usual cheap acrylic yarn I'd always used. This is the project that made me see that I was good enough to use the better stuff and if it was worth my time to knit it, it's worth it to buy the good stuff, in other words "crap in, crap out". 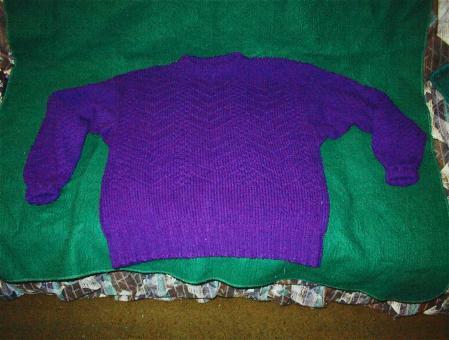 Years of washing have taken its toll on this sweater and it's difficult to see the patterning anymore. So, having read the Yarn Harlot's newest book, Knitting Rules! (Stephanie, the Yarn Harlot, gets credit for the above quoted phrase), I paid close attention to these words, "Julia Child said that when it comes to wine for cooking, you should use the best you can afford. I beg you now to do the same with yarn. Buy the best you can afford. The stuff you make is your legacy and your time is really worth it." Enough said. I bought nicer yarn and I have started this same sweater again. It's a very pretty rose heather yarn, wool/acrylic blend. 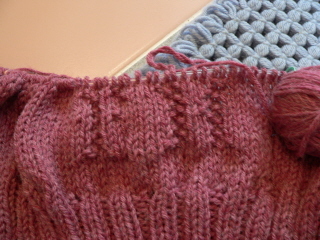 As I did with the first sweater, I knit my initials into it. I started the initials last night but I was tired and afraid I'd screw it up so I finished them this morning when I first woke up before I did anything, even eat breakfast, which for me is saying something. I really wanted to see these initials done! They look pretty cool, if I do say so myself. I'll be very pleased to have another favorite sweater. I don't have a picture of the other pair of socks I have started since I've just gotten past the ribbing and there's not much there to see. I'll take a picture when I'm further along on them. The yarn is 100% merino wool sock yarn in beautiful shades of blues and purples and very soft. I thought they'd be perfect jeans socks. The needles are size 1, I believe, and knitting with them makes me feel like I'm knitting with pickup sticks. I really have to be awake and aware and have good lighting to knit these socks. They'll be beautiful, though. On the other hand, the worsted weight socks (the brown, purple and green, so far) are so easy to work with, I can knit them without my glasses, as I proved last Friday while under the dryer at the hairdresser. That's why I'd like to start the other green sock today. It's good to have an easy, small project to take with me so I don't feel like I'll go nuts without something to do with my hands. And now for today's weather report: It's still humid but it is cooler. The sun was peeking out a little while ago but it's back to looking cloudy. The important thing to remember is....it's not raining. Just how much fun and food can you fit into one three day weekend? We found out. All you need to do is bring a cute baby with you and your fun is guaranteed. On Saturday, we went to Kendra and Dave's house in Pennsylvania. 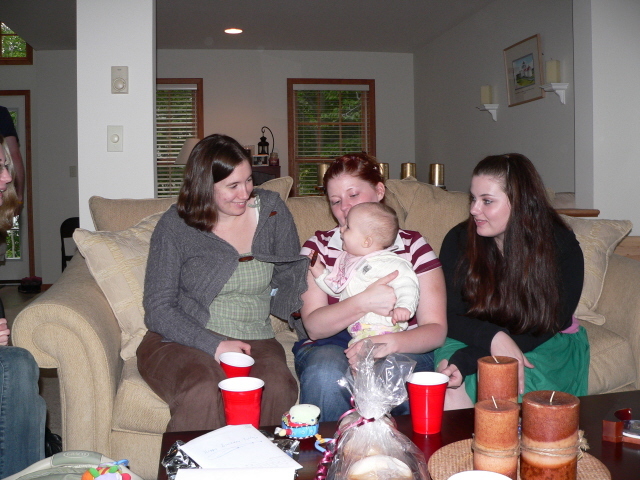 We were not able to go to her shower since Lorelai was sick that day so we made the trip to see the house and bring the gifts. It would have been perfect if we didn't have to contend with the remnants of Earnesto as we drove to and fro. Coming home, the rain was so heavy, the wipers couldn't keep up. It was seriously nerve-wracking. Nevertheless, we had a lovely dinner and dessert and they have a lovely home. It was great to see everyone. Here, Lorelai is fascinated with Leandra's watch. 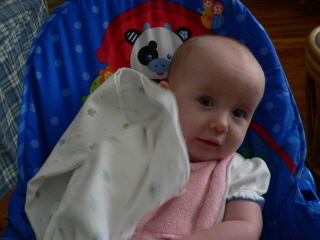 It's hard to get pictures of the very busy Lorelai without some movement. She's a wiggle worm. 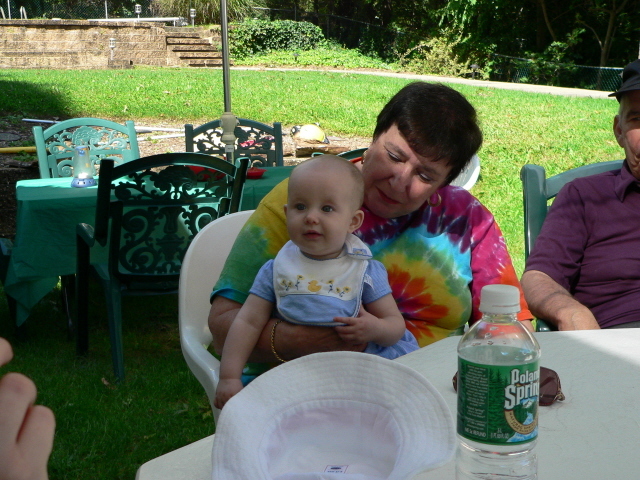 On Sunday, we again traveled to Pennsylvania, Tobyhanna this time, for Kristen and Michael's housewarming party. 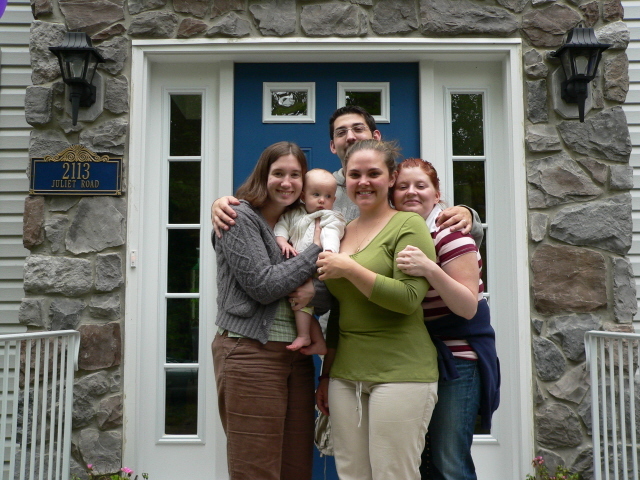 Kelly, Lorelai, Michael, Kristen and Meg in front of the pretty new house with the blue door. We were not anticipating such a difference in temperature from Long Island to the Mt. Pocono area. When we got home, it was 72 here and 55 there. Kristen had tried to warn everyone that it was cold and still wound up handing out sweatshirts to those who didn't heed the warning. 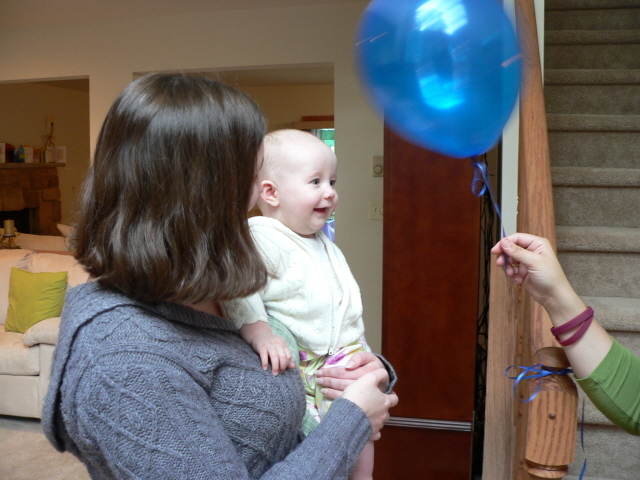 Lorelai's first encounter with a balloon. Of course, the balloon came home with us. Yesterday, we attended the annual Labor Day feast at the Washington's. 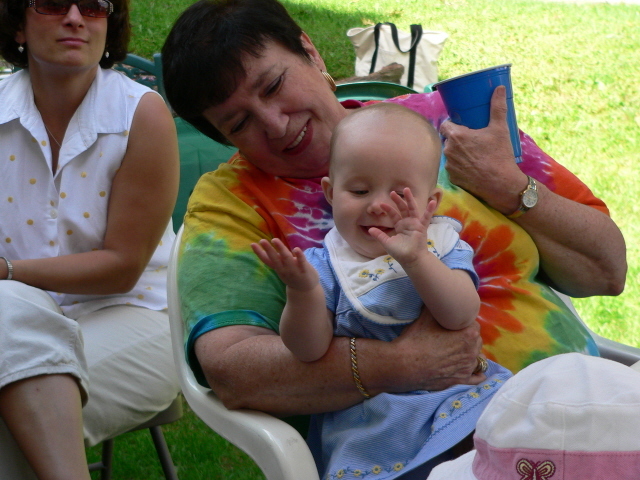 Experienced Grandma, Gloria, and the lovely Lorelai, who was fascinated with all the colors of Gloria's shirt. Lorelai entertains the crowd with her hand-clapping skills. As Gina said, she's seen enough performances at the theatre. She knows what to do. 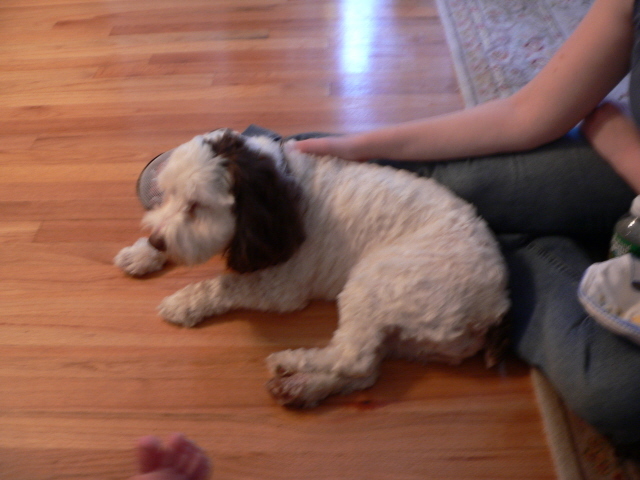 Peter's dog, Patch. Peter said that Patch tends to protect babies and sure enough, when Lorelai was asleep on my lap, Patch posted himself at my feet. 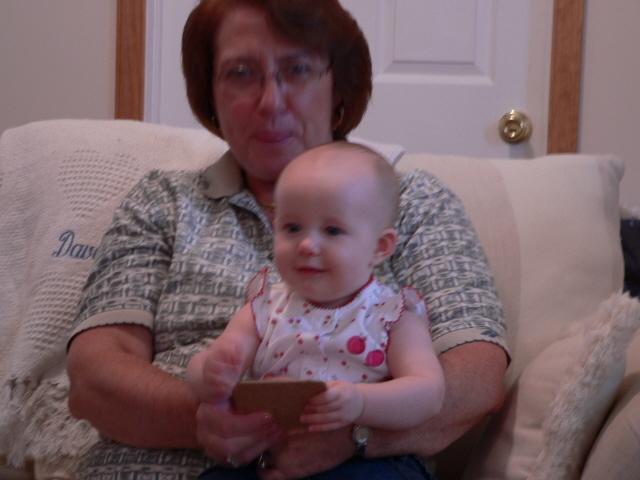 Kelly came into the house to find baby and dog with Nana. He's such a sweet dog. So, the long weekend is over and I officially ate too much. 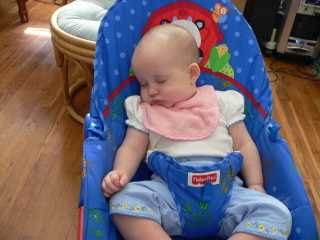 Lorelai should sleep for a week after all the activity but she won't! I have lots of chores to do since I let everything wait until the weekend was over. I'm still procrastinating. That's why I'm doing this. Tsk, tsk. P.S. 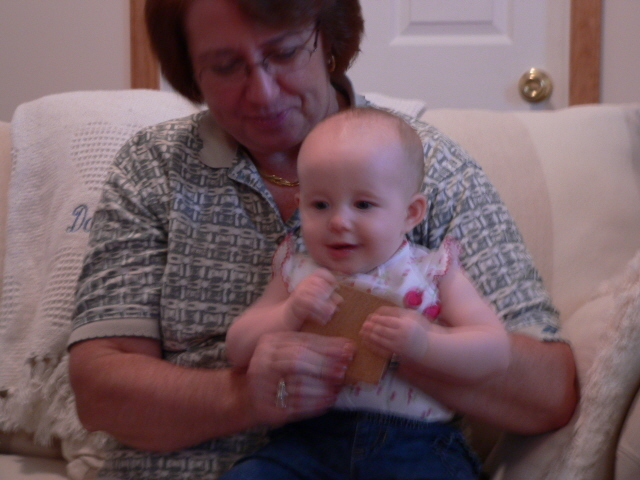 These pictures were sized for email and not the web so they're a little big. Weather report: It's cloudy but it's not raining....yet. I'll take it. I'm getting over another cold, the second I had for the month of August. Actually, the first cold probably wasn't a cold all along. It wound up needing 10 days of antibiotics to leave my system and it was much worse than any cold I've ever had from day one. Who knows, I forgot to call the doctor back to get the results of the throat culture. Whatever. The cold that's on its way out now was just your regular garden variety cold and it wasn't hard to deal with. It was just annoying to realize I spent the entire month either feeling sick or feeling sore joints from the oppressive humidity. I'm definitely ready for fall weather. 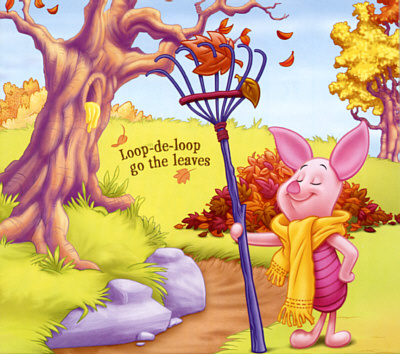 I just hope we get to enjoy some fall weather before the cold of winter sets in. You don't want to hear me whine. But whine I shall. We have a busy weekend planned. Tomorrow, we're off to Kendra and Dave's for lunch. That's a two hour drive. Sunday is Kristen and Michael's housewarming party, another two hour drive. Monday is the Labor Day party at the Washington's. Thankfully, NOT a two hour drive. I'm really looking forward to seeing everyone, though. I just hope all that traveling isn't too much for little Lorelai. P.S. It's not raining today.....yet.